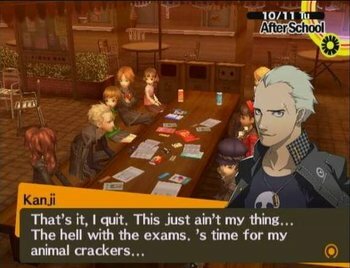 Pictured: Kanji, and Kanji's face, talking to his friends. Certain games have a drawing of a character's face, usually in a portrait style. In RPGs or other games with menus, these are usually displayed next to the character's name. Also, in some games with talking NPCs where one can't directly see characters' faces, a portrait may be displayed next to their text box. If they don't, then they may be of Nominal Importance. (Some games may try to give everyone a portrait, but there are usually unique ones for important characters.) Prevalent in RPGs, since there tend to be a lot of NPCs in them, as well as a staple of Visual Novels. Certain games may also have different portraits for the same character to indicate facial expressions and the like. A few facial expressions, anyway. Cave Story. There's some interesting variations: Balrog's head is so large that his character portrait can only show half of his face, and Misery's hair is a different color in the portrait than it is on her sprite. Solatorobo has portraits for most every character, excepting the absolute most minor of NPCs, and most characters have at least one alternate portrait for different moods or facial expressions. Some major characters not only get face portraits but also full-body portraits that show up for dramatic moments or soliloquies. The Wonderful 101 has a series of different portraits for each character, these change as the cut-scene continues and there are quite a few for each of the characters and they're partially animated. In-game you can press a button to reveal the character's eyes (they're wearing masks) for no reason to boot. Seems to be pretty common in adventure games. The Quest for Glory series, some of the King's Quest games, and Gabriel Knight all had text boxes with pictures of the characters' faces. Quest for Glory IV (which had very detailed pictures featuring most of the character's upper body) and Gabriel Knight had pictures whose mouths moved when they spoke. King's Quest V was one of the earliest games to feature these, with close-up images of Cedric, Icebella, and Beetrice, among others. King's Quest VI featured 16- and 256-color versions, and they were even voiced and animated in the talkie edition. The PC adventure game Secrets of da Vinci: The Forbidden Manuscript shows an interactive portrait of Valdo, the protagonist, on the inventory screen. It indicates what he's wearing and is where the player changes his outfit. After Valdo meets the character Marie, she also appears in his portrait, and their relative position to one another indicates the current state of their relationship. This was a very common feature in FPS games back when they were still called "DOOM Clones," and faded from popularity sometime after the first Quake. The portrait was usually tied into your health display and would become increasingly bloodied or otherwise damaged as your health went down. Catacomb Fantasy Trilogy and Wolfenstein 3D both predate DOOM's use of the device. DOOM, for its part, made it into a somewhat useful gameplay element by having the marine's face turn and look in the direction from where he was taking fire. Nitemare 3D was Lighter and Softer than most early FPS titles, and had Hugo's portrait turn moldy and skeletal rather than bloody, an effect that was actually fairly creepy. In a surprisingly recent example, Overwatch has a portrait next to the health bar that shows what character you're playing, and what skin you're using for the character. Team Fortress 2 does something similar, with the portrait of the class you're playing on the HUD being a fully animated 3D model displaying the current weapon and cosmetics that class has equipped. Shaw's Nightmare has a portrait that gets progressively sick as you lose health. Banjo-Kazooie actually uses this despite having the characters in question in clear view, right next to the heroes and with their faces visible. They do this for the bosses as well as certain other characters. Batman: Return of the Joker for the NES shows small character portraits of Batman and the boss in every boss stage. The occasional dialogue sequences in Metroid: Fusion use portraits, although one of the three characters with speaking parts doesn't have much of a portrait, being an AI, and the other two don't talk outside of one or two scenes. Mega Man X used them in the first game onwards, and passed it on to the Zero and ZX games. Classic Mega Man followed suit in the SNES and PlayStation titles (one of which was later ported to GBA stateside). Legends used them in places (not necessarily for dialogue, though). Battle Network and Starforce, by virtue of being RPGs, use them the most extensively. Sonic Rush, Sonic Rush Adventure, and the DS version of Sonic Colors use these. The 3DS version of Sonic Generations use these as well, but with 3D models. Panel de Pon and Tetris Attack both use them for dialogue. Both games animate blinking; PdP animates mouth movements, TA does not. The Baldur's Gate series uses portraits for the main character and all party-joinable NPCs. In the second game and its expansion, major villains and some other plot-central NPCs also get their own portraits. The Castlevania series uses them in all their Metroidvania style entries since Castlevania: Symphony of the Night. Chrono Cross has portraits in text boxes and menus, though Chrono Trigger only has them in the menu. Most Final Fantasy games use them on the menus; the only ones that use them in dialogue are the Final Fantasy Tactics games and the Game Boy Advance re-releases. Final Fantasy Tactics A2 brings them back in the same manner and unique NPC units have their own portrait as well instead of reusing a generic one. Golden Sun. If they have a portrait, they're either important to the story or selling you stuff. Used in the Grandia series. Characters display various facial expressions in text boxes. In The Granstream Saga, all character emotion is depicted via portraits as the 3D models don't even have faces. Kingdom Hearts: 358/2 Days has them in conversations. It has to, since outside of full motion video cutscenes, the models always have the same blank stare going. In Re:Coded, in order to avoid the jarring effect in 358/2 Days, the developers blended the way dialogues were portrayed in The World Ends with You with the well known 2D pics of the 3D renders of the characters. The Lunar series started making use of character portraits in its first game back in 1992, and kept with it for every game in the series. The remakes started adding extra portraits to express emotions. The MARDEK series uses character portraits for every single talking character in the game. Facial expressions and all. In the first one, the player chooses a portrait for their character, which doesn't need to be remotely connected to the Player Character's actual appearance. The same goes for all the NPCs, who all have portaits from among the few dozen stock ones available in the game, only a small handful of the most important ones getting unique portraits. Given the repetitiveness and unavoidable occasional inappropriateness of the portraits, it doesn't exactly make each character a unique snowflake. Normally averted in Neverwinter Nights 2: the portrait is rendered directly from the Player Character's 3D face, including whatever equipment they currently have on. Played straight with the companions in the Mask of the Betrayer expansion, however. Of particular note, the PSP remake of Persona 3 gives portraits to several characters who didn't have them them originally. Persona 4 plays with the rules of Nominal Importance by leaving a seemingly-incidental character (to be specific, the gas station attendant from the opening) without a character portrait until she's confronted in the true ending and revealed to be the one truly behind everything. Persona 5 has drawn potraits of the characters appear during dialogue scenes, and even occasionally has the character portraits rip through the screen to punctuate a particularly emotional or tense moment. In a case of Painting the Medium, the traitor is revealed as such when they suddenly gain a much more sinister-looking portrait than their usual set. Weirdly, Morgana always has a portrait for his humanoid Funny Animal appearance, even when masquerading as a house cat in the real world. When he permanently loses said humanoid appearance at the very end of the game, it's conveyed as such by his portrait switching to a house cat one. Pokémon Mystery Dungeon: In Rescue Team, only story-important NPCs and the starting forms of the Hero and Partner had portraits. In Explorers and Gates To Infinity, every Pokémon has a portrait, but only certain NPCs and the starters' first evolutions have alternate portraits for different moods. Also done rarely in Pokémon Black and White, only used when characters are talking via the XTransceiver or when talking with N.
Last Scenario has different portraits for facial expressions and emotions for certain characters, as well. So does The Way (RPG Maker) and The Reconstruction. Completely averted in Visions & Voices. There aren't even menu portraits. Exit Fate uses very large portraits, featuring not just the face, but usually the character's entire upper body as well. The Infyn Prism has all important characters having one. Lampshaded by one NPC in a house in Tarnset. Lunarosse uses these for anyone who is either a recruitable character or an plot-important NPC. Rakenzarn Tales implemented these in Version 2 for important characters. Sands of Destruction gives portraits to named characters; random villagers don't have them. Playable characters also get a menu portrait, and dialogue portraits change with emotions. Beastlords also lose their portrait when they transform. 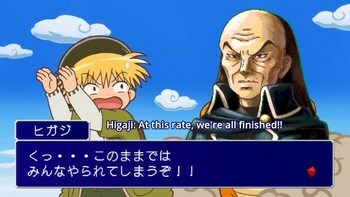 Suikoden. Anyone who has a portrait is either important to the story in some way, or they're one of the 108 Stars of Destiny you can recruit. Suikoden V in particular takes things Up to Eleven by giving most characters in the game multiple portraits to represent different moods. Suikoden Tactics gives generic characters eyeless portraits. Skits in the Tales Series. Most of the games also have these by each character's status in and out of battle. In the former case, they often have their expressions change based on what's happening to them. Tales of Xillia and its sequel also have character portraits pop in for the heroes at the top-left corner of the screen for the heroes, and the top-right for enemies. Besides Boss Banter, the character will call out enemy weaknesses, status effects, and other events that happen in battle. The Ultima series from VI on, until it goes 3D in IX and just zooms in on people. Valkyrie Profile has portraits which take up approximately half of the screen when dialogue boxes are present. There are several portraits for each playable character which help reflect the emotional aspects of the dialogue. Inazuma Eleven has a unique face portrait for every single character in the game. All 1000+ of them. Although only characters important to the story have multiple portraits for different facial expressions. In Wild Arms 2, you can name every storyline-important NPC one meets, but only a very few of them have portraits when naming them or talking to them; this can lead to some Interface Spoilers. For example, Tim is a seemingly unimportant NPC met early on, but it's obvious he'll end up being important since he has a character portrait. It's even more amusing considering one meets the "leader" of Tim's little circle of friends first - who doesn't have a portrait. A similar tactic can be used in Wild Arms 3 and Wild ARMs 5. Wild Arms 4 and Wild Arms XF had portraits for pretty much everyone, but there were still "generic" and "unique" portraits, allowing the player to tell them apart. Xenogears uses basic portraits in the dialogue boxes. Used oddly in Dragon Age: Origins. The Warden's character portrait is a freeze-frame from the character model, but then the player gets to choose the exact angle at which s/he is drawn. In the Ys series, NPCs in important conversations have portraits that take up at least a third of the screen. The Kiseki Series has a variety of expressions for several characters, not just party members. Estelle] in particular, has a wide range of emotions. Important characters in Machine Knight get portraits with a Cheeky Mouth that flaps as the dialogue scrolls; they do occasionally change expression, but naturally make use of Informed Equipment. Unimportant characters get no portrait. An interesting case in Enchanted Arms, mixing this with Going Through the Motions; minor conversations and events are portrayed by the character models shifting through a set of emotions during a split-screen, instead of just a head- or bustshot. Similar to Star Ocean: The Last Hope, but fully animated instead of frozen poses. Endless Frontier takes this to 11, with every character having a set of lavish portraits that go down to their thighs and is able to stuff four people onto a single screen at a time. Touhou Labyrinth featured these, being as simple menu avatars to full portraits during character conversations, with varying degrees of quality. It's updated re-release, Special Disc, later added the ability to use custom character portraits. In Holy Umbrella, characters have animated portraits displayed next to their speech boxes. The portraits usually fit a small rectangular frame, though some of their emotes exceed it. One character described in another character's Info Dump also gets a portrait. Starting with Harvest Moon 64, Harvest Moon games have used the "multiple portraits for different emotions" version when they're not using Going Through the Motions. You can tell how important a character is by how many portraits they have; Love Interests will have five or six, while minor characters sometimes have only one. Mitsumete Knight R: Daibouken Hen uses the text box version of this trope for all voiced characters of the game. Their facial expressions however change in real time as the dialogue is unfolding, instead of waiting for the dialogue to finish to change the expression, and instead of using the swapping a new portrait method. The Trauma Center series, with multiple portraits for different emotions. Warship Gunner 2 uses portraits whenever someone's speaking. Clock Tower: Used alongside character speech, as the game had no voice acting. It also functions as an indication of Jennifer's emotional/physical state during normal gameplay. Ib: Each character (except for one-liner NPCs) has several portraits for each emotion. Sometimes, the character's portrait appears with no text accompaniment, just to show the player how they're reacting without words. Despite the fact that Ib herself never speaks, her portrait does appear in the save menu (due to the game being made in RPG Maker). The Witch's House: Viola's appears in the menu. Under certain circumstances, there's a chance that it'll be replaced with a nightmarish Slasher Smile version. Normally, there aren't any portraits displayed beside text, making the appearance of Ellen's near the end quite shocking. Mad Father: There is an extensive and detailed range for each character, particularly Aya, who has 22 different portraits for every occasion. Final Fantasy Tactics and Final Fantasy Tactics Advance uses them in the dialogue boxes. Most of the Fire Emblem games use these. Interestingly, these ones have a few different expressions, move their mouths when speaking, and blink, even if their portrait isn't currently the "active" one. They also have a tendency to move around to simulate the person they represent moving. The Shining Series use these for all the characters in the party. The Shining Force Gaiden games also used them for cutscenes. Only characters who are in the eponymous force or have speaking roles got portraits, though. Taken to a bizarre level in Shining Wisdom where Mars gets a portrait despite being a Heroic Mime and the game itself having only a bare Excuse Plot. Super Robot Wars, being based on anime and manga, uses these to an extent. All characters appear like this in Ace Attorney; either looking directly at the camera or, in case of attorneys and assistants during courtroom sessions, looking at the side. Notably, all the characters have many unique animations, ranging from sweating, waving, bouncing up and down, and a "freak out" to name some. Parodied ◊ in episode 21 of the 2017 series of Magical Circle Guru-Guru, when the G-Fantasy guys gets one out of nowhere. Nishiji: The portrait cut-in technique makes you the star, no matter the context. Turnabout Storm, being done in the Visual Novel style of the Ace Attorney series, uses them in exactly the same manner; though they are only animated during courtroom sessions, the rest of the time being stills of the characters. Devil's Attorney uses these in an ever better way, seeing as the two series featured (Ace Attorney and Disgaea) also used these extensively, leading to a situation where Phoenix's courtroom portraits were used in cutscenes resembling the ones from Disgaea, and they do not look out of place at all.note Oh, and by the way, Devil's Attorney pre-dates Turnabout Storm. Crystal Heroes has them in the playable RPG scene, where the characters are depicted in their portraits from shoulders-up and all have a variety of different facial expressions. Mario Party TV: Mr. Doom, Steeler, Holms and Clel use pictures of themselves to mimic the portraits used in the in-game Ranking charts, which change appropriately in accordance with their status. Pink Kitty Rose utilizes these during non-voiced playthroughs, accompanied by captions illustrating her feelings about whatever is on-screen. Sweat drops and facepalms are the most common.